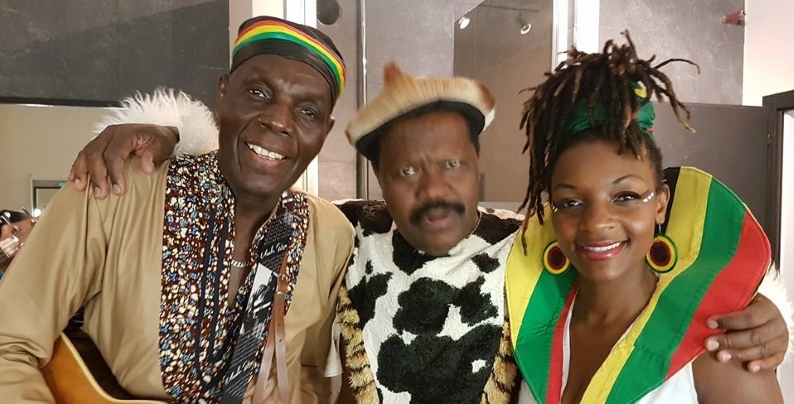 ZimHealth promised you a night to remember and oh what a night it was. 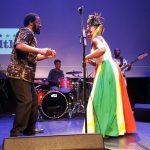 This years’ ZimHealth fundraising gala was more than just an event: it was a celebration of Zimbabwean culture and music, a powerful reminder of the universality that binds us and a tribute to the arts. 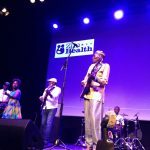 For 2016 ZimHealth took over the halls of Geneva Uptown to host the superstar Oliver Mtukudzi and the Black Spirits, the talented Vimbai “Vee Kay” Zimuto and the Zimbabwean poet laureate Albert Nyathi. 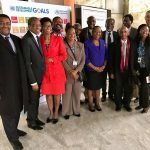 Our evening began with welcoming remarks from His Excellency Ambassador Mushayavanhu, the head of the Zimbabwean Republic’s mission to the United Nations Office and other international organizations in Geneva. 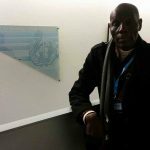 Dr Michael Mbizvo, the founding chairman of ZimHealth Europe, was the evening’s Master of Ceremony and he deftly handled the role of making the evening flow from start to finish without a glitch. 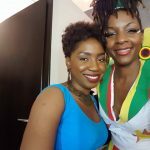 Vimbai and her band were the first to light up the stage with a short but powerful set that shifted between slow solemn mbira songs and fast upbeat beats. 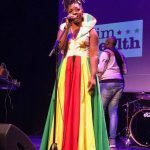 Dressed in a beautiful, flowing dress inspired by the ZImbabwean flag, the daughter of Chitungwiza brought her infectious personality to the stage and shared many delightful anecdotes in-between her songs. 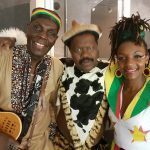 Her set included her popular song “Ku n’anga” and “Ndakanaka” and by the time she retired from the stage, the audience was up dancing on its feet. 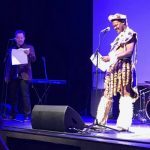 Albert Nyathi, arguably Zimbabwe’s most famous poet, was our evenings next performer and he took to the stage dressed in traditional Ndebele regalia and reciting traditional Ndebele praise poetry, izibongi zamakhosi. 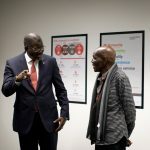 Cries of ‘Bayethe’ filled the halls as Albert brought some of the ancient history and lore of Zimbabwe to Geneva in his beautiful words. 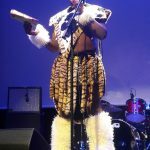 The latter part of his performance was a reading from his latest books ‘My Daughter’, ‘My Son’ and a reading from his anthology, ‘Ten Conversations to End AIDS’ which he read with his co-author, Dr Daniel Low-Beer, the World Health Organisation’s Coordinator for HIV Strategic Information and Planning. 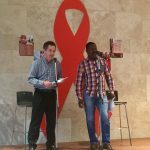 Besides bringing the house down with laughter, the two offered a sobering and poetic reminder of the role we all have in the fight against HIV/AIDS, one of ZimHealth’s focus areas. 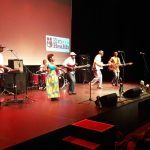 By the time Oliver Mtukudzi came to the stage, one could have been forgiven for thinking the evening’s highlights had passed but Oliver Mtukudzi & The Black Spirits put paid to any such notions. 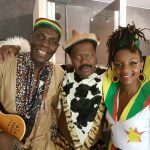 Through two sets, that took the audience through nostalgic memories and brought them dancing and shouting to their feet Tuku, as he is affectionately known in Zimbabwe, sang to Geneva and reminded us why his fame had spread far beyond the borders of Zimbabwe. 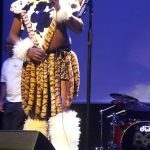 His sets included the classic Neria and Todii as well as recent hits such as Shamiso, a song he first sang for his daughter at her wedding. 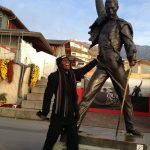 As always it is difficult to describe the power of a live performance to those who were not there but we can confidently say the air was electrified. 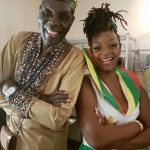 Perhaps the best proof of this was the fact that during his sets, all the albums he had donated to ZimHealth sold out and left us with many disappointed fans on our hands. 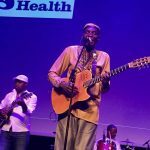 Tuku also took the time to highlight the work that ZimHealth does and thank the crowd that filled Geneva Uptown to capacity. 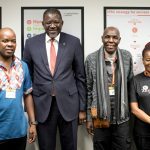 His words, ‘Thank you for helping us help ourselves’ aptly summed up the mission statement of ZimHealth as it brings together Zimbabweans and friends of Zimbabwe from all over the world in an effort to make a positive, lasting and deep change in the lives of ordinary Zimbabweans. His most memorable remark was when he sang that it was not about “what we have achieved, but what we have overcome”. It was an honour to see him bring his work as a UNICEF Goodwill Ambassador to the fore even in the middle of a live show. And what a show it was. 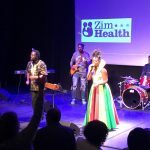 Its end came much too soon but those who came to see it could rest content that ZimHealth had delivered on its promise, a night to remember and a chance to support our continued efforts to sustain health services in Zimbabwe. 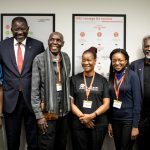 We also held an auction of traditional soapstone sculptures donated to ZimHealth by Tinashe Chikowore and a raffle whose prizes included some of the sculptures, Oliver Mtukudzi CD’s, ZimHealth T-shirts and other memorabilia. All proceeds from the evening’s events go directly to funding ZimHealth’s programs in Zimbabwe. 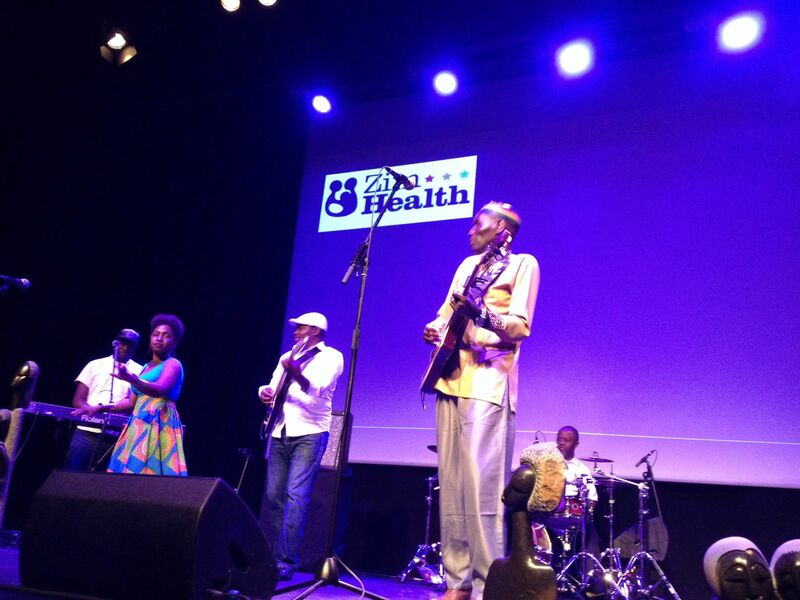 ZimHealth would like to express our heartfelt gratitude to Oliver Mtukudzi, Mrs Daisy Mtukudzi and the Black Spirits, to Vimbai Zimuto and her band, Albert Nyathi and Dr Daniel Low-Beer, the management of Geneva Uptown and the volunteer students from Institut International de Lancy who all made this event an incredible success. 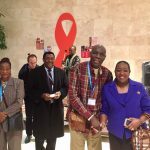 We also extend our thanks to the supporters and friends of ZimHealth who attended as well as the ZimHealth members from all over Switzerland, Europe and Zimbabwe who supported us in the runup to our gala event of 2016. We hope to see you all again soon!